Our small natural punched tin hanging star lamps are an easy way to update your southwest, rustic, or Spanish colonial style home. They can also be used as outdoor light fixtures for your patio or garden decor. 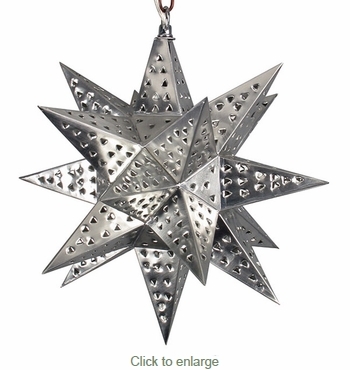 These imported hanging star lights are handcrafted in Mexico by talented tinsmiths. Illuminate your own space or share this beauty with friends and family and give a tin hanging star as a gift.